As my previous post touched on the woman herself, I thought it best to start off Iconic Muslims with none other than Sarah Joseph, humble woman. Sarah (OBE), is most famously recognised as editor of Emel magazine. She is an international commentator on Muslim lifestyle and British Muslims in particular, having spent the last decade as a writer and broadcaster on Islamic issues. 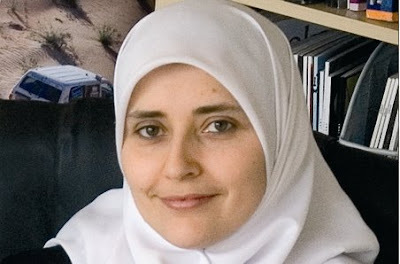 Raised as a Catholic, Sarah converted to Islam at 16 and married Mahmud al-Rashid in '92. She now resides in London with both husband and three children (whom I have met and adore). The acclaimed Emel.com is a must have for every literate person. For further insight into her background just Google 'Sarah Joseph' and check out CNN coverage, interviews, her speeches and responses to current affairs. I have met Sarah too and was blessed to talk to her about several ideas and issues. She listened, paid full attention, held her smile and spoke with eloquence and enthusiasm as though that was the last moment. Masha'Allah, may every mother, wife and sister be a Sarah Joseph, an Iconic Muslim. Research on Sarah's lifestyle and gardening too, it's very amusing. Sarah is indeed a brilliant human being, a well versed diplomat on matters of an Islamic nature and true to her beliefs. I had the wonderful pleasure of being Chief Operating Officer for emel for what turned out sadly to be a very short period of time. In that time I got to know Sarah pretty well, and like all of us the perceived confidence that is seen and exhausted through communicating with many many different groups also hides a distinct lack of confidence. Sarah truly does believe in everything she stands for and believes in, however this also shows itself in sometimes an unbending way, not a holistically helpful way. The fact that every time you read about Sarah you will also preface with 'raised a catholic' is, in my view, a way of trying to be more accepting of the Islamic way of life than someone who was already raised this way, a need for over acceptance, which is not always a healthy way to announce yourself. However, the work that has been done has truly helped create a much needed bridge between Muslims and Non Muslims but in reality this needs to be achieved at a local everyday level and I thank Sarah for at least starting the process that this could actually happen.